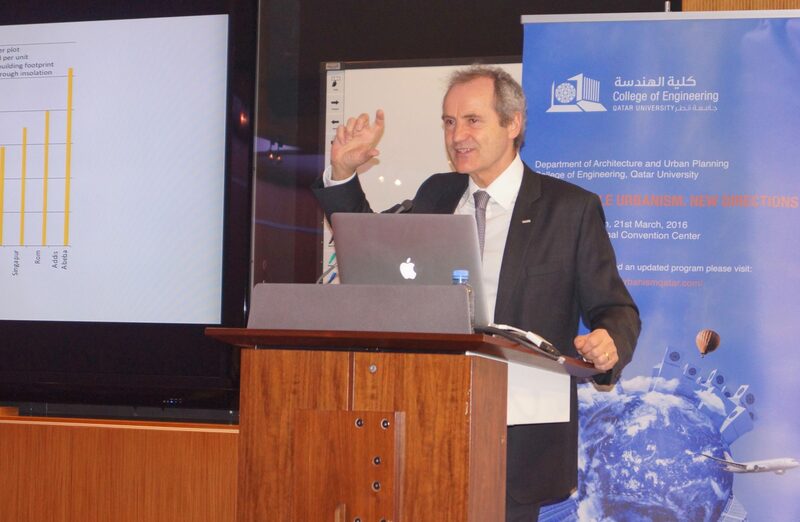 Professor Dr Gerhard Schmitt explaining his proposal for Citizen Design Science, Sustainable Urbanism New Directions Workshop, 21 March 2016, University of Qatar, © University of Qatar. Social sciences must take on a leading role in the transformation from top-down to citizen-designed urban change, management and governance, argues Gerhard Schmitt, Professor of Information Architecture at the Swiss Federal Institute of Technology in Zurich (ETH), founding Director of the Singapore-ETH Centre in Singapore, and ETH Zurich Senior Vice President for ETH Global. Present day cities are not sustainable, as the emerging paradigms for sustainability and resilience demonstrate. Yet as urban systems will provide housing and working environments for two thirds of the global population in the near future, they must become sustainable in cooperation with their environment. “Social sciences must take on a leading role in the transformation from top-down to citizen-designed urban change, management and governance”. 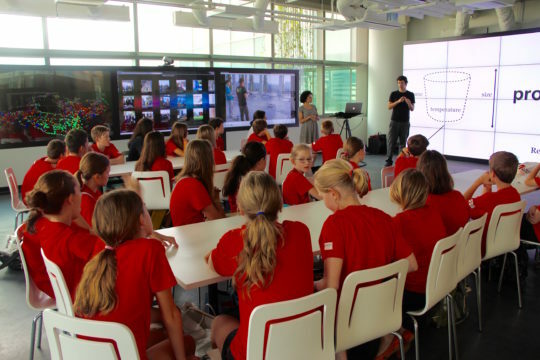 Young Citizen Design Scientists in the Value Lab Asia at the Future Cities Laboratory of the Singapore ETH Centre. Photo courtesy of Dr. Gerhard Schmitt. Social sciences must take on a leading role in the transformation from top-down to citizen-designed urban change, management and governance. While the hardware of the urban infrastructure remains similar across climate zones, political systems and cultures, the biggest development occurs in the evolving cultures of urban governance in the fastest-growing cities of the world. This leads to a widening gap between decision makers that have a long-lasting impact on the city’s physical appearance and the citizens of those urban systems. It will be the role of social sciences to identify and bridge this gap for cities that do not have well-established participatory structures. We are deeply convinced that the cognitive and design capacities of citizens in different cultures and geographic locations are comparable. At the same time, they are hardly employed effectively nor efficiently to support the planning and design process. Cognitive science is therefore an integrating part of the Responsive Cities research project in the ETH Singapore Future Cities Laboratory and in the Chair for Information Architecture at ETH Zurich. Results from this research directly influence the Big Data-informed Urban Design project, the Engaging Active Mobility project, as well as the Cyber Civil Infrastructure project in the Responsive Cities scenario. The greatest challenge is to constructively engage the cognitive capacity of future citizens into the design process, relying on personal and information technology resources. The goal is not to create an automated system, but to give citizens the opportunity to improve step-by-step the city they live in. Professor Dr. Gerhard Schmitt, Sustainable Urbanism New Directions Workshop, University of Qatar, 21 March 2016. © University of Qatar. The ETH Massive Open Online Courses to distribute urban design knowledge turn out to be a rich source of feedback from more than 160 countries. In this process, IT is playing a growing role: less in the automation of tasks for the planning and design process, but rather in the combination of human cognitive and decision-making capacities with artificial intelligence programs. This opens new research fields that should benefit from the differences between cultures, economies and ecologies in the quickly evolving urbanisation areas of the world. Citizens, equipped with evolving information and communications technology (ICT) devices will be at the forefront of social, economic and ecologic developments towards smart and responsive cities. Citizen Design Science, enabled through Massive Open Online Courses, will become a globally accessible instrument to achieve this vision. Big Data-informed urban planning approaches will support city governments to make better decisions for their city. Together, they will form an urban governance that will increase the chance for sustainable future cities. Gerhard Schmitt is Professor of Information Architecture at the Swiss Federal Institute of Technology in Zurich (ETH), founding Director of the Singapore-ETH Centre in Singapore, and ETH Zurich Senior Vice President for ETH Global. His work focuses on the definition and design of Information Architecture (iA) as the next level of Computer Aided Architecture Design (CAAD). The creation of a simulation, visualisation and interaction platform for the Future Cities Laboratory (FCL) is at the centre of his research, which focuses on the development of intelligent design support systems using artificial intelligence methods. From 1998 to 2008, he served as Vice President for Planning and Logistics and Member of the Board of ETH Zurich. He directed the development of ETH’s strategy and planning in cooperation with the 16 scientific departments and the central administration. In 2000, he initiated the development of a third and virtual campus, named ETH World, with an international master plan competition. In 2003, Gerhard Schmitt initiated the concept for Science City, ETH’s new campus in Zurich, a revolutionary interchange between ETH Zurich and the public. In 2007, he initiated the transition of ETH Science City towards a zero carbon emission campus. His efforts in developing and transforming ETH Science City earned him the European Culture of Science Award in 2010.